Women may wait for a positive pregnancy test to improve their diet, stop drinking alcoholic beverages, and generally opt for more positive habits. While adopting a healthy lifestyle at any stage of pregnancy is beneficial, research suggests that a mom’s habits before conception also influence her baby’s well-being at birth and for his or her entire lifetime. Priming the body for pregnancy optimizes both a mom’s health and that of her child. 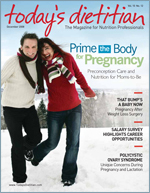 In 2005, the Centers for Disease Control and Prevention (CDC) issued “Recommendations to Improve Preconception Health and Health Care.” The report details the goals of preconception care, which apply to an estimated 62 million American women in their childbearing years (aged 15 to 44) whether they’re having their first child or their fifth and even if they do not intend to conceive. As defined by the CDC, preconception care includes screening for health risks such as diabetes and obesity, health promotion and education, and implementing interventions that address the identified risks to mom and the outcome of her pregnancy. The 10 recommendations detailed in the CDC report are meant for use by individuals, communities, public health and clinical professionals, and governments. While the authors do not specifically mention RDs, they do emphasize the critical role of healthcare providers who routinely treat women for implementing preconception care goals. More importantly, the report cites nutrition and weight control as important topics to discuss with women prior to pregnancy, providing RDs with an opportunity to participate in the crucial process of preconception care. Preconception care involves more than a single visit to the gynecologist, internal medicine physician, certified nurse midwife, or nurse practitioner in the months prior to a pregnancy. Priming the body for pregnancy is an ongoing pursuit that ideally begins early in a woman’s reproductive life. Pregnancy preparedness makes sense, particularly because many pregnancies are unexpected. A developing fetus is highly susceptible to birth defects and other problems during the first eight weeks of pregnancy, a time when women may not realize they are expecting and typically long before their first visit with a healthcare professional to address their pregnancy. Preconception care should be tailored to meet a woman’s needs, accounting for chronic conditions such as overweight or underweight, type 1 or type 2 diabetes, and hypertension. Women who have had a pregnancy end in a low birth weight baby (less than 51/2 pounds), a preterm infant (born between the 20th and 37th week of gestation), a child with a birth defect, or infant death should seek medical advice prior to conceiving to prevent problems with subsequent pregnancies, according to the CDC’s report. Prepregnancy overweight is at an all-time high. Of women who could become pregnant, 33% are considered obese (body mass index [BMI] of 30 or higher) and 62% are overweight (BMI of 25 or higher).1 The majority of U.S. adults are unaware of how health and lifestyle factors, including obesity, influence reproductive health and childbearing. About 1.85 million American women aged 18 to 44 are affected by diabetes, mostly type 2, according to a 2004 National Center for Health Statistics report. Women with either type 1 or type 2 diabetes are three times more likely to deliver a baby with a birth defect compared with those without diabetes, are more likely to miscarry, and run a greater risk of having pregnancy end in infant death, among other complications, according to a 2005 practice bulletin from the American College of Obstetricians and Gynecologists. Macrosomia is also more common among children born to women with poorly controlled diabetes throughout pregnancy; large babies may have medical problems at birth and run a greater risk of becoming overweight and developing type 2 diabetes later in life, according to the CDC. According to the American Diabetes Association, an estimated 57 million Americans are at risk for developing diabetes because they have prediabetes (fasting blood sugar of 100 to 125 milligrams per deciliter). Elevated blood glucose concentrations prior to pregnancy may be a sign of what’s to come once conception occurs, as they often portend gestational diabetes and postpregnancy type 2 diabetes. The good news is that preconceptual diabetes management has the potential to reduce the risk for pregnancy loss and congenital malformations for about 113,000 births per year, according to the CDC report. A complete blood count screens for potential problems, such as prediabetes, that women can head off prior to pregnancy. The 2005 Dietary Guidelines for Americans has identified calcium, fiber, magnesium, vitamins E and C, carotenoids, and potassium as problem nutrients for American adults. The guidelines also encourage women in their childbearing years to consume foods rich in iron to prevent a deficiency. The CDC report indicates that an estimated 8 million women of childbearing age suffer from iron deficiency severe enough to cause anemia. Research suggests that iron stores at the time of conception are a strong indicator of a woman’s risk for iron-deficiency anemia later in pregnancy, when iron needs to be increased dramatically.9 Iron deficiency during pregnancy may raise the risk for preterm delivery. Testing blood levels of ferritin, a reflection of stored iron in the body, is the best way to determine iron-deficiency anemia. Many women in the childbearing years are short on choline, another nutrient that plays a role in preventing neural tube defects. A case-controlled study published in the American Journal of Epidemiology found that insufficient maternal intakes of choline during pregnancy were associated with a fourfold increase in the risk of having a pregnancy affected by a neural tube defect. Higher choline intake was associated with a reduced risk of neural tube defects, independent of folate intake, the study says. Women require 425 milligrams of choline daily and more when pregnant and lactating. Researchers at Iowa State University recently reported that choline intakes for women and pregnant women are far below the adequate intake levels. Only 10% or less of these groups are eating close to the recommended amounts of choline.10 Choline is particularly abundant in egg yolks—one large yolk provides more than 25% of a woman’s daily choline needs—and beef and is found in lesser amounts in foods such as pork, salmon, cod, and cauliflower. While multivitamins are generally regarded as adjuncts to a balanced diet, research suggests they are particularly beneficial when consumed prior to and throughout pregnancy. A daily multivitamin is a low-risk and relatively low-cost approach to improving the chances of having the healthiest baby possible. University of North Carolina, Chapel Hill researchers found that taking multivitamins every day prior to conception reduced the risk of preterm birth by about one half in a group of about 2,000 women. A meta-analysis of 41 studies published in 2006 in the Journal of Obstetrics and Gynaecology Canada suggests a strong link between taking multivitamins before and throughout the first trimester of pregnancy with a reduction in neural tube defects, heart defects, limb deformities, and cleft palate. Reasonable amounts of caffeine, considered to be less than 200 milligrams per day (about the amount in 10 ounces of Starbucks coffee), probably have little effect on fertility. But more than that may jeopardize pregnancy once conception occurs. A 2008 study in the American Journal of Obstetrics and Gynecology concluded that consuming 200 milligrams of caffeine or more on a daily basis increased the risk of miscarriage in a group of more than 1,000 pregnant women. The higher chance for miscarriage was attributed to caffeine, rather than just coffee; caffeine intake from noncoffee sources such as soft drinks, tea, and hot chocolate showed a similar risk of miscarriage to coffee alone. This well-regarded study prompted the March of Dimes to decrease the recommended daily caffeine limit for pregnant women from 300 to 200 milligrams per day or less. No alcohol intake is recommended during pregnancy, and the advice is the same when a woman is trying to conceive. Moderate drinking—defined as no more than one drink per day—may lengthen time to conception. (A drink is defined as 12 ounces of regular beer, 5 ounces of wine, or 11/2 ounces of 80-proof distilled spirits such as rum, vodka, or whiskey.) Most importantly, a woman might consume alcoholic beverages while unaware that she’s pregnant. Alcohol is particularly problematic during the first trimester, when cell differentiation is taking place and organs are developing at a rapid pace. Alcohol is capable of causing irreversible harm to a developing fetus through the deprivation of oxygen and nutrients necessary for normal development. Regular physical activity is a necessary component of any healthy lifestyle plan, but it’s particularly useful for weight loss and weight control, reducing the risk of type 2 diabetes and management of blood glucose levels in type 1 and type 2 diabetes, reducing total and low-density lipoprotein cholesterol and raising high-density lipoprotein cholesterol, and keeping blood pressure in check. Regular exercise before pregnancy is beneficial to both mom and baby. Researchers at the University of Washington surveyed 688 mothers and found that those who performed the most vigorous exercise in the year before pregnancy were 81% less likely to develop gestational diabetes, a condition linked to abnormally large babies and difficult labor, than their sedentary peers, while moderate exercisers had a 59% lower risk. The benefit held up even when mom was overweight. A study published in 2002 in the Maternal and Child Health Journal found that a group of physically active women had a 30% to 50% lower risk for pregnancies affected by neural tube defects, even when they did not take multivitamins prior to conception and irrespective of their weight. According to the Dietary Guidelines for Americans, adults require a minimum of 30 minutes of exercise on most days for weight maintenance (provided calorie intake is in line with calories burned), 60 minutes on most days to manage body weight and prevent gradual weight gain, and 60 to 90 minutes to maintain weight loss. RDs can contribute to preconception care by tailoring balanced eating plans for women in their childbearing years that satisfy nutrient needs while promoting a healthy weight. Educating women about the influence of body weight on pregnancy chances and outcomes is a particularly pressing issue, as are the many nutrient gaps that need to be closed prior to conception and the dangers of alcohol and excessive caffeine. While this article provides just a brief overview of the goals of preconception care, it’s clear that RDs play a vital role in improving the health of women and their families. — Elizabeth M. Ward, MS, RD, lives in Reading, Mass., and is the author of several books, including the forthcoming Expect the Best: Your Guide to Healthy Eating Before, During, and After Pregnancy. 1. Ogden CL Carroll MD, Curtin LR, et al. Prevalence of overweight and obesity in the United States, 1999-2004. JAMA. 2006;295:1549-1555. 2. National Research Council and Institute of Medicine. Influence of pregnancy weight on maternal and child health. Workshop Report. Washington, D.C.: National Academies Press; 2007. 3. Gensink Law DC, Maclehose RF, Longnecker MP. Obesity and time to pregnancy. Human Reprod. 2007;22:414-420. 4. Wang JX, Davies M, Norman RJ. Body mass and probability of pregnancy during assisted reproduction treatment: Retrospective study. BMJ. 2000;321:1320-1321. 5. Nguyen RH, Wilcox AJ, Skjaerven R, Baird DD. Men’s body mass index and infertility. Human Reprod. 2007;22:2488-2493. 6. Kaiser L, Allen H; American Dietetic Association. Position of the American Dietetic Association: Nutrition and lifestyle for a healthy pregnancy outcome. J Am Diet Assoc. 2008;108:553-561. 7. Berry RJ Li Z, Erickson JD, et al. Prevention of neural tube defects with folic acid in China. N Engl J Med. 1999;341:1485-1490. 8. Waller DK Shaw GM, Rasmussen SA, et al. Prepregnancy obesity as a risk factor for structural birth defects. Arch Ped Adol Med. 2007;161:745-750. 9. Scholl T. Iron status during pregnancy: Setting the stage for mother and infant. Am J Clin Nutr. 2005;81:1218S-1222S. 10. Jensen HH, Batres-Marquez SP, Carriquiry A, Schalinske KL. Choline in the diets of the US population: NHANES, 2003-2004. FASEB J. 2007;21:lb219. 11. Rothman KJ, Moore LL, Singer MR, et al. Teratogenicity of high vitamin A intake. N Engl J Med. 1995;333:1369-1373.